A very popular plant used by the floral trade to add fullness to cut flower arrangements. 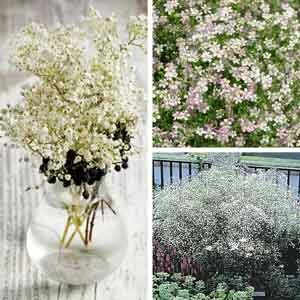 Baby’s Breath brings the same airy touch to the garden landscape. Its delicate cloud of foliage and dainty flowers soften the landscape and create a wonderful filler between more substantial plants. Different species are available; from low creeping types to tall forms that create a bushy spray of blooms. Baby’s Breath is a very easy plant to dry for crafts and floral arrangements. Simply cut the flower stalks and hang upside-down for a few days until dry. A wonderful plant for rock gardens and mixed borders. Low forms look great spilling over container edges. Tall varieties are a must-have for cut-flower gardeners. Flowers are perfect for use in fresh or dried arrangements.